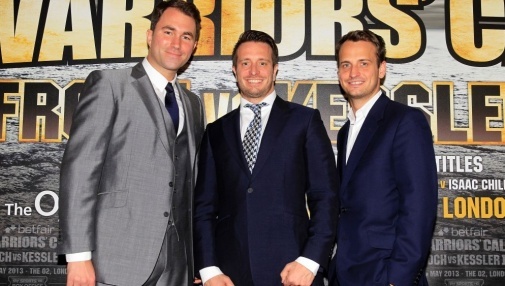 Matchroom Boxing and Team Sauerland have agreed an historic TV rights deal to share their big fight nights. UK fight fans will get up close and personal with the likes of Brahmer, WBO Super Middleweight World champion Arthur Abraham, IBF Cruiserweight king Yoan Pablo Hernandez and rising stars such as Patrick Nielsen and Micki Nielsen, Vincent Feigenbutz, Erik Skoglund and Jack Culcay. German fight fans will get to see international superstars in action like IBF World Welterweight champion Kell Brook, Super Middleweight World title challenger James DeGale MBE, WBA World champions Scott Quigg and Jamie McDonnell, Tony Bellew, Nathan Cleverly, former two-weight World champion Ricky Burns, WBC Featherweight World title challenger Lee Selby and Olympic Gold medal heroes Anthony Joshua MBE and Luke Campbell MBE. “I'm delighted to get this done and be working closely with Kalle, Nisse and Team Sauerland,” said Matchroom Boxing’s Eddie Hearn.